Unless you are just using the recording feature of Resolume to make video clips, at some point you will want to route the video from Resolume out of your computer, hopefully to a really big screen. Before you can configure the outputs in Resolume, you will need to set up the displays in your computer's operating system. 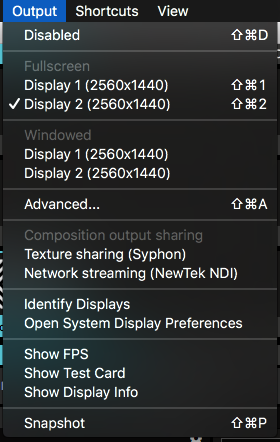 You should do this before you run Resolume, in order for the displays to be available in the Output menu. So first we make sure the display or projector is recognised by your computer. 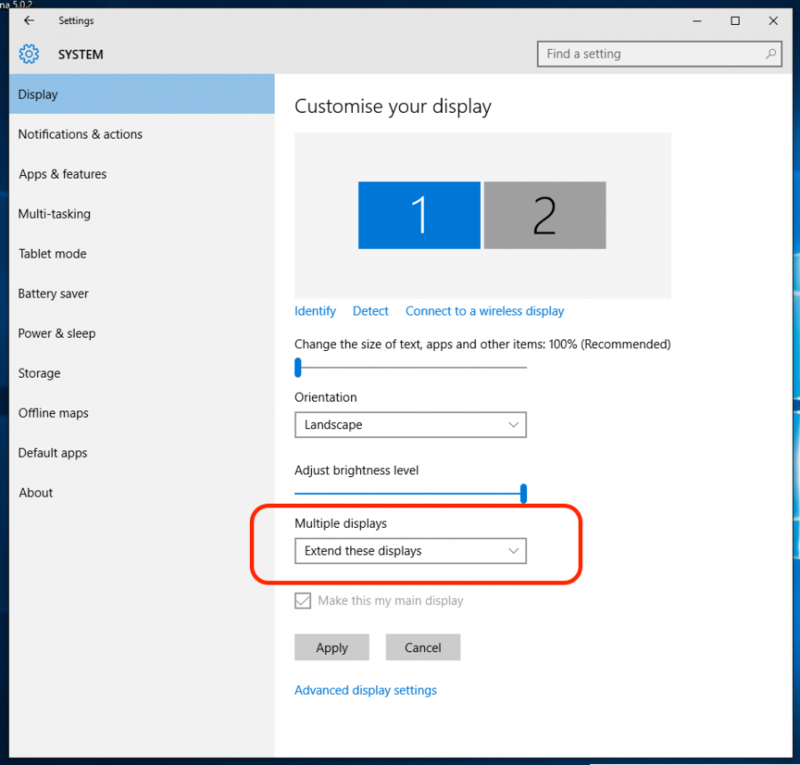 To set up the displays in Windows, open the Display panel via the Control Panel: Settings > System > Display. Alternatively, you can right-click on the Desktop and select Display Settings from the contextual menu. On the settings tab make sure you have at least two displays visible and active. This is usually called having the two screens in 'extended desktop' mode. 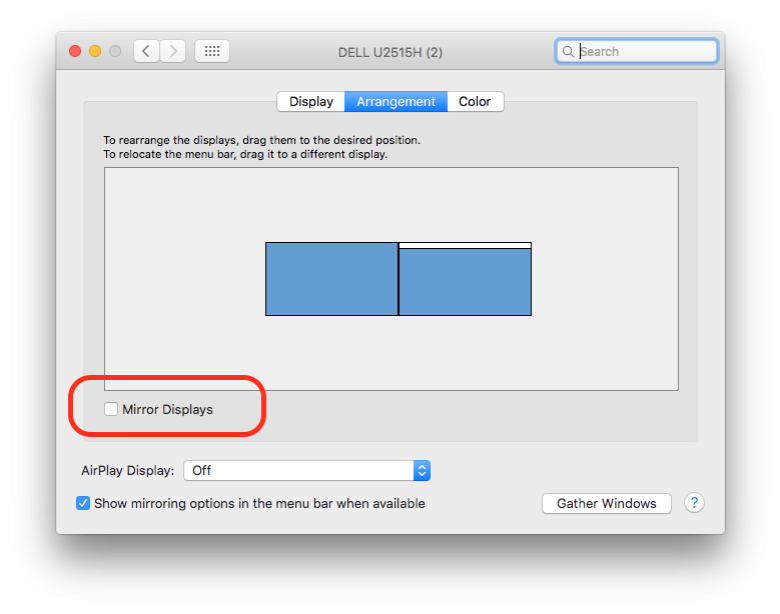 Open the Display Preferences in System Preferences via the Apple menu: System Preferences > Displays. Then on the Arrangement tab make sure 'mirror displays' is turned off. Now you have two separate displays on your computer. Now start Resolume and check out the Output menu. 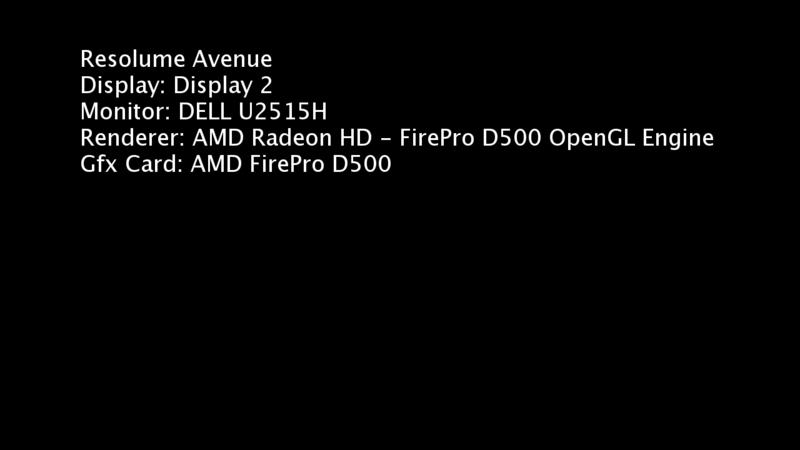 The Fullscreen and Windowed options enable you to select which of your computer displays the main Resolume output should go to. For a straightforward single screen setup, Fullscreen is usually the option you want. Resolume will fill the complete window with its output. Windowed output just fills the second output with a rectangle exactly the size of your composition. This is sometimes useful if you are using an external scan converter or are working with multiple applications. You can stop all output by selecting the Disabled option. Tip! If you accidentally went fullscreen on the main window, you won't be able to access Resolume's controls anymore. Don't worry! Just hit CTRL-SHIFT-D (CMD-SHIFT-D on a Mac) to disable all output and get the interface back. Hidden away in this tiny menu options is an amazing world of possibilities. This will enable sending your main composition output via the Syphon framework on Mac, or the Spout framework on PC. Essentially, this will let you share the image created in Resolume to another application for further processing. Read more about Syphon and Spout. This will enable sending your main composition output via the NewTek NDI protocol to other computers on the same network. This will overlay your outputs with a numbered and coloured image. The numbers will match the numbers your computer has assigned to those monitors. 3-1-2-8-9-11-10-5-6-7-4? Yes, I know those numbers don't match the order of the monitors on the table. No matter which order I plug the cables, Windows seems to assign these numbers randomly. This just proves how much we need a feature like this. A quick shortcut to get to your computer's display settings. You know, for when those numbers above somehow turned out wrong. This will show a little FPS counter in the top left of the Output Monitor. This is an indication of how far you're pushing Resolume. Tip! Higher numbers are better. If this consistently drops below 30, it means you're pushing things too hard. Bonus Tip! Numbers higher than the refresh rate of your monitor are bad. It means you're not 'v-synced' and you're making your computer do more work than it's actually able to show. Shows a handy little test card with color bars, the current resolution and time, and a moving diagonal line. This will overlay each connected display with EDID information, which GPU it's connected to, and which GPU is currently being used for rendering. Tip! Don't worry if the GPU listed under 'Gfx Card' is not the most powerful card in your computer. This just tells you which card you are physically plugged in to. The GPU listed under 'Renderer' is what matters and this should be your most powerful card. This will save a .PNG still image of your output to your Recordings folder and import it to your current composition.